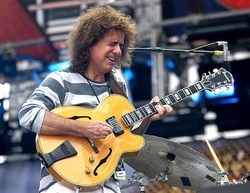 A warm Saturday saw the coming of one of the most expected musicians that the Festival de México brought to us: Pat Metheny. One day before the closure of this great cultural and artistic festival, we could witness an outstanding performance of this legendary guitar player, which additionally, was joined by two extremely talented musicians, Mexican drummer Antonio Sánchez, and American bass prodigy Ben Williams. The concert took place in the Teatro de la Ciudad, which is a beautiful place for concerts (plays, ballet, etc), the sound is clean and the view great in this intimate scenario. 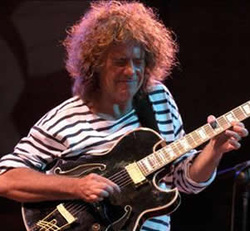 So Pat Metheny came to the stage at 17:10 hrs ( approximately), took an acoustic guitar, sat down and began to play. The stage was decorated with some kind of palm trees that created a beach-like and pleasant mood. He performed a couple of songs that showed his incredible talent from the first notes. For the third song, he changed the guitar and took the famed Picasso guitar, which is an odd instrument (a guitar, of course) which can create different sounds, tones and textures at the same time. I would say it is like five guitars in one, so that’s what Metheny played. With that instrument, he performed “The Sound of Water”, which was composed for his record with Brad Mehldau, a fabulous mixture of sounds and moods that was highly acclaimed by the audience. Immediately after it finished, Antonio Sánchez and Ben Williams appeared on stage, took their instruments and began to play the first Pat Metheny Trio song of the night. The next one was “Bright Size Life” an old song from Pat’s debut album, which was recognized and loved by the crowd. Minutes later, Sánchez shared his virtuosity, playing a short drums solo, which, of course, was applauded by his countrymen. After eight songs, Metheny dedicated at least five minutes to speaking. First, he said he was really happy to return to our country because of the warm reception he always gets here; then he explained that the trio was originally composed of him, Sánchez, and Christian McBride, but the latter could not attend because he was a busy man with a difficult schedule and that is why Ben Williams joined (recommended by McBride, by the way). 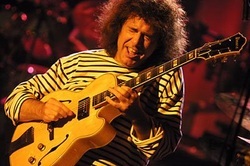 Metheny praised his band-mates, saying they were some of the most talented and well-appreciated musicians of the jazz scene nowadays. After that, he talked about the songs performed so far and introduced us to “When we were free”, taken from his 1996 album “Quartet”. Well, after that song, they left the stage but as you guess, returned a couple of minutes later in order to perform two more songs that finished this two-hour concert. To be honest, so far this has been my favorite concert of the year, but what could we expect from musicians of this quality? An unforgettable evening!